"American Horror Story: Coven" is coming to a close Wednesday (Jan. 29), with the girls set to take part in the Seven Wonders test to find out the identity of the next Supreme. We've seen the episode and we have to say, it is full of so many twists and turns our heads are still spinning. Read on for a few spoiler-y tidbits. 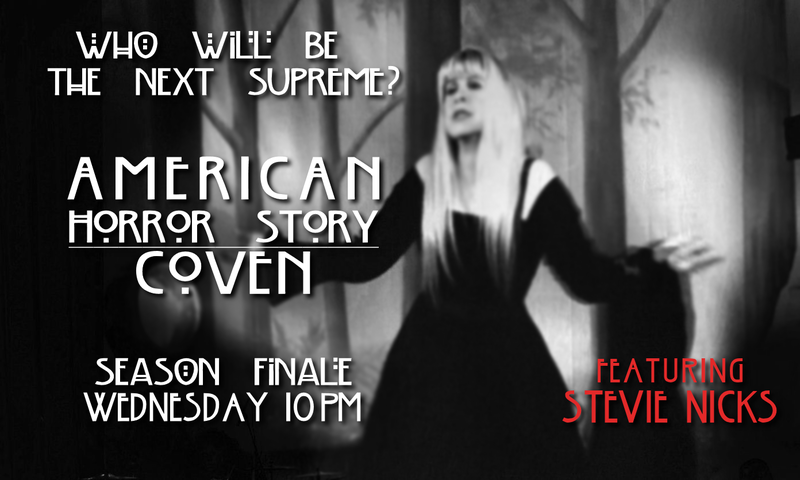 We were right about Stevie Nicks returning for this episode. She's on hand to perform, as luck would have it, "Seven Wonders" by Fleetwood Mac. Their song "Silver Springs" is also used. The Seven Wonders is the Supreme test for a reason. Even if only one witch can pass it and become the Supreme, that doesn't mean every other witch merely fails and comes out the other side unscathed. So, be prepared. We've always known Madison was a stone-cold ... witch, but she really takes the cake in the finale. There has been insight into the own personal Hells of Queenie, Delphine and Marie. In the finale, we add several more personal Hells to the list. It's quite insightful. The ending of the episode leaves us wishing there was a second season of "Coven." We guarantee you're going to like the finale. "American Horror Story" airs Wednesday nights at 10 p.m. ET/PT on FX. "AHS: Coven" offered-up unplugged versions of "Rhiannon", "Has Anyone Ever Written Anything For You" and now "Seven Wonders". Am I the only one that was certain "Sisters of the Moon" would surely make the cut as well? Perhaps it was too expected and that's why it didn't? What happened to the "redo" song that Stevie and Lindsey were supposed to be doing that many thought was going to be Melacine? Also, is Silver Springs the b-side that she mentioned as fitting into the story line of Coven? First, I don't see how it fits into the story line. Second, I am suprised she would consider Silver Springs just a b-side given it was FM's comeback hit/sinlge in 1997. Seven Wonders is pretty cool though. I remember Ryan Murphy saying music video extravaganza for the opening...might not be an unplugged if they are montaging sequences together. Maybe this will open the door for Stevie to preform seven wonders in concert this summer and 2015 on the next tour keeping our fingers crossed!!!. I was talking to my sister about "Sisters of the Moon" being on AHS yesterday actually. I was Absolutely certain it would be in the episode as well...Awesome to see "Seven Wonders" make it though! @Brian - possibly .... With Christine back in the fold it's likely we'll get a couple more songs from 'Tango In The Night' since a few of her best songs are from that record. So this may be a way for Stevie to test out "Seven Wonders." The other thread about Stevie's appearance on ahs won't allow more responses. I'm not arguing about this person or that one....All of Fleetwood Mac are relevant! But they shortened the song, and I could be mistaken but that vocal is not on the 1987 album. So, maybe they went back to the masters and put another vocal close to the one we know. Unless I'm wrong. ...which I doubt, the song was shortened, and the vocal was different. The song sounded a little different but it still sounded like the way she sounded then, No way she could sound like that now, And as far as it being shortened they just faded it out and didn't let the whole song play and it was arranged for that part of the show, I wish she would have done it live but I don't think it would sound that good Stevie has lost a lot of her highs and lows that's why her more upbeat songs like stand back and edge of seventeen don't sound at all like they used to.